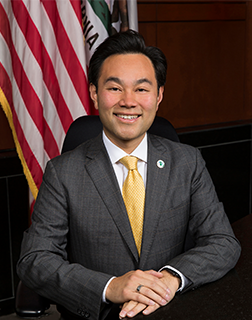 Anthony Kuo was elected to the City Council in 2018, bringing almost eight years of experience as a Planning Commissioner, including four consecutive terms as Chairman. During that time, he also served on the City’s Task Force on Housing Needs for the Developmentally Disabled and the Ad Hoc Committee on Veterans Affordable Housing and graduated from Irvine’s Community Police Academy. Anthony represents the City of Irvine on the Boards of Directors of the Irvine Barclay Theatre, the Irvine Community Land Trust, and the San Joaquin Wildlife Sanctuary. In addition, he is a member of the Liaison and Coordinating Committees for both the Irvine Unified School District and the Tustin Unified School District. Anthony is the first member of the Irvine City Council to have grown up in Irvine. A proud product of Irvine’s public schools, he attended Alderwood Basics Plus, Lakeside Middle School, Woodbridge High School, and University High School. For more than 20 years, his family owned and operated Chinatown Restaurant near UC Irvine, remembered fondly by many longtime Irvine residents. In the community, Anthony serves on the Board of Directors of the Irvine Children’s Fund and the Advisory Boards for Crime Survivors and Brandman University’s School of Business and Professional Studies. He previously served in Board leadership roles for the Brigham Young University Management Society of Orange County, the Raise Foundation of Orange County, the Irvine Valley College Foundation, and the Exchange Club of Irvine.